A magazine is more than ‘content’. It is an artefact, a style choice, a treat, a mini-poster, a source of comfort or of tribal allegiance, and a way to shape thoughts and test opinions. Though websites and social media deal with many of the itches once scratched by magazines, there are few marriages of app and screen that are quite like reading a magazine. 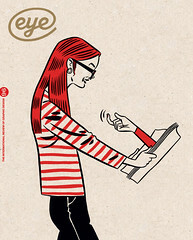 A magazine is very much a ‘designed’ experience, which is why Eye is devoting two special issues to the subject. A mag’s editorial structure, examined in ‘Anatomy of a magazine’, determines the way readers absorb and enjoy its words and pictures. Even when art directors and editors junk the rules and reinvent the form, there are certain elements – covers, features, front matter, advertising and so on – that inform the way a magazine is created, perpetuated and refreshed over time. This judiciously balanced mix of surprise and familiarity requires design teams who combine sensitivity and self-effacement with steely determination and a firm grasp of printing deadlines. These are qualities demonstrated by our Reputations interview with Gail Bichler, design director of the New York Times Magazine, and a feature about Tom Wolsey’s art direction of Town magazine. Bichler leads a team that forges exemplary art direction each and every week, while dealing with a stream of challenges, from virtual reality to print-only supplements. Wolsey made a magazine for an untapped readership in the 1960s, forging close bonds with a new breed of photographer. Eye 97 will delve further into magazines past and present – both independent and ‘mainstream’ – but as a taster we have Martin Colyer’s review of five new books about influential magazines, including Rolling Stone, The Face and Octavo. Big illustrated books can be an exercise in nostalgia, but Colyer has no time for the notion that a ‘golden age’ has come and gone: some of the best examples are recent. The age of Trump, Brexit and #metoo has prompted some of the most innovative and effective magazine-making of the past century, as demonstrated by New York’s ‘Cosby: The Women’ cover. At a time when practitioners fret about the purpose of graphic design in a troubled world, magazines provide an opportunity to engage with real issues and subjects, to entertain and inform with typography, illustration, information graphics, photography and layout. At its best, magazine design is an endlessly rewarding dialogue with contributors and readers. Top: New York magazine, 27 July–9 August 2015. Portraits: Amanda Demme. 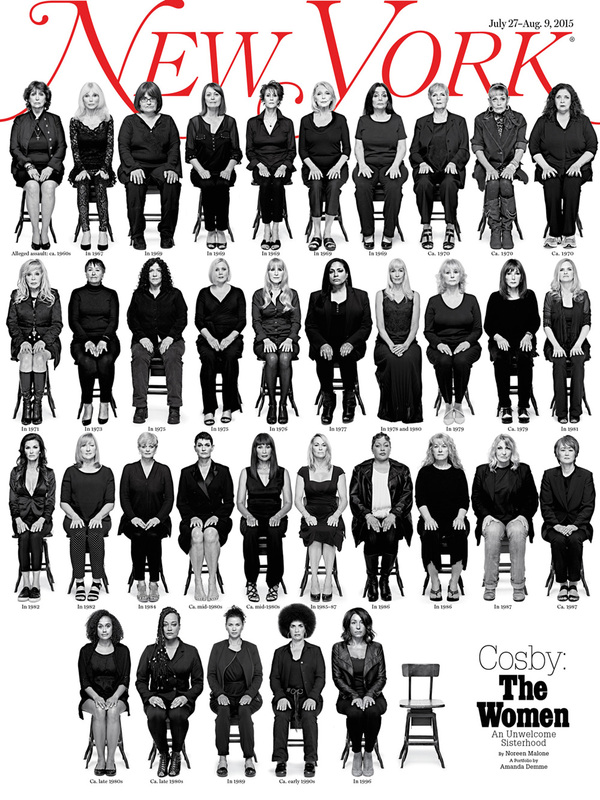 This influential cover was the result of months of research and writing initiated by photography director Jody Quon, who cold-called six of the women who had come forward to accuse comedian Bill Cosby of assault. ‘I thought it would make a great portfolio,’ says Quon. ‘The cases started as early as the 1960s and up to modern-day.’ Eventually they had 35 women for the cover. ‘Before the photo shoot, the women had never met each other,’ says Quon. ‘It went from very sober to laughing and crying.’ After publication, the vacant seat on the cover inspired the hashtag, #theemptychair, a symbol for yet unheard victims of sexual assault. See ‘Looking at magazines looking at themselves’.